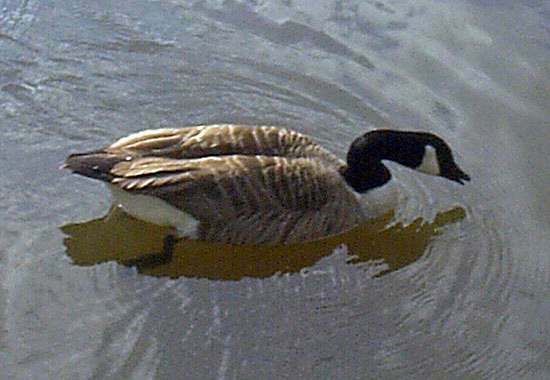 This introduced resident from North America is often to be seen on ponds, lakes and occasionally rivers in Britain. Canada Geese graze on vegetation near the water's edge, sometimes nesting in small groups. 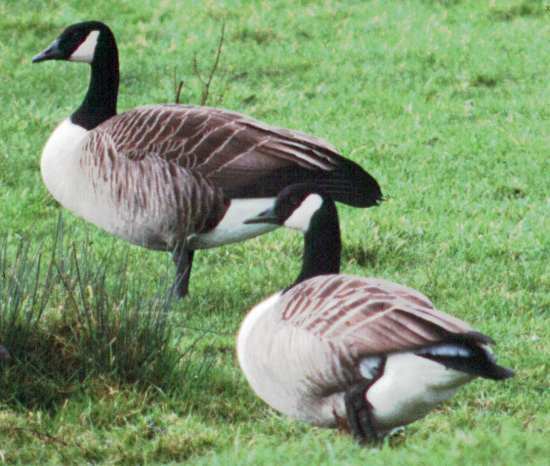 The male and female are very similar in appearance, and these birds are sometimes mistaken for winter visiting Brent Geese; however, the 'oink' of a Canada Goose is easily distinguished from the croaky call of a Brent Goose. With a length of 90 to 100cm and a wingspan of typically 170cm, these are large birds but nevertheless strong fliers. Canada Geese nest beside lakes, marshes, rivers and seashores. In parks they are considered a great nuisance because of their messy droppings and their incessant noisy oinking.